The city of Durango and Durango Mountain Resort (Purgatory) in southwest Colorado is an area devoted to an active outdoor lifestyle. Nestled in the San Juan National Forest, this western town is where the high desert meets the high alpine. Blackjack Lodge sits atop sloping cliffs overlooking Lake Purgatory, with sweeping views of the Hermosa Cliffs, Spud, Engineer and Needles Mountains from its large picture windows. Surrounded by groves of pine and aspen trees, it affords complete privacy, though conveniently located just one mile south of Durango Mountain Resort. The large, open-plan family room has stunning views, a massive wood burning, sandstone fireplace and state-of-the-art entertainment complete with Sony 51' Surround Sound TV, DVD/CD, VCR and Stereo. A second family room (or the 'Bear Den') with 2-Twin Trundle Bed, TV, DVD, a regulation-size billiard table and also a ping-pong table is located in the basement, adjacent to the fourth bedroom which is outfitted with two sets of bunk beds and the location makes it an ideal room for the kids. All king and queen beds have Modal linens and goose down comforters to ensure a cozy and comfortable night's rest! A wonderful bonus after a day of outdoor activities is the Hot Springs Spa 6 person hot tub on the covered deck. Luxuriate in its soothing warmth while taking in the stunning lake and mountain views and cool, clean mountain air. At night, the stars seem almost touchable. Our home is that wonderful combination of rusticity and luxury. The bedrooms are comfortable and private and the family areas are well appointed with fine leather couches. Ceiling fans in every room and radiant-heated floors make it comfortable throughout the year. Our location offers you a choice between the dozens of activities available in the area, or complete seclusion - whichever kind of vacation you seek. Commercial Real Estate Broker in the Dallas Ft Worth and North Texas area representing national developers and tenants looking for new development and new business locations. Love all outdoor recreation, especially in Southwest Colorado. The Durango area and the San Juan National Forest are one of the most beautiful places on earth. The affordable price of real estate and potential for appreciation help in the realization of a life long dream. You will bask in the peacefulness and luxury of seclusion at The Blackjack Lodge. The amenities are wonderful to enjoy at your home away from home. The views are amazing of the surrounding mountains and you feel like you could almost touch the stars at night! 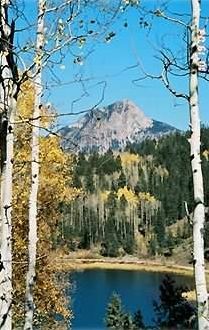 Sits atop sloping cliffs overlook Lake Purgatory, with sweeping views of the Hermosa Cliffs, Spud, Engineer and Needles Mountains from its large picture windows. Surrounded by groves of pine and aspen trees. One-car garage. Additional parking at property. Two Family Rooms, Hot Springs Spa Hot Tub, Billiard Table, Wood-burning Gas Fireplace, Phones (FREE local & long distance within USA & Canada), High-Speed Internet (DSL) Connection, Sony 51' Surround Sound Big Screen TV, Satellite Direct TV, DVD/CD Player, Toaster Oven, Coffeemaker, Blender, Cookware, Plates, Glasses, Silverware, Full-size Washer and Dryer, One-car Garage, Gas Grill (barbecue), No Pets please. Good place for lots of people. You NEED 4x4 when it is winter! Snow was 7’ high Beside driveway. This is a nice place for a large group. It is at the very end of a long driveway. There were several other cabins along the driveway which appear to be only used in the summertime. Snow was up to the roof around almost all the other cabins. We had record-breaking snow when we were there. A guy spent all day on a miniature bull dozer keeping the road to where it could allow access. You must have four-wheel-drive if you plan to come to this place when it is snowing. The owner has lots of useful things such as a baby crib and plenty of cooking supplies. He is also very nice and quickly responds with any questions. Thank you all for staying with us. Yes 4 wheel drive is required in the winter. Yes it has been a record year of snow. We had 10 feet in February, 5 or more feet so far in March. 333 inches so far this year, 6 feet above our yearly average. Ski conditions have been spectacular. So glad we were accommodating and that your family had a great time. Beautiful! Comfortable, very clean and nicely decorated! Best place I've stayed at! You sill be amazed at the luxury perks this home offers! Thank you all for staying with us and for your review. Glad you enjoyed a few of our perks! Come back soon ya here. The home is situated in such a beautiful spot with views to purgatory lake and mountains. We spent a lot of time outside taking it all in. The hike down to the lake was a welcomed daily ritual. The kitchen is furnished well and the home is much larger than it appears in pictures. The basement is huge and can sleep 6-7 in addition to the 3 bedrooms upstairs that can sleep 6. This home is great for large families. The owner is very attentive and proactive should any need arise. Thank you all for staying with us, we look forward to your return someday. Great Cabin, big, very clean, nice views, lake near by, we spent a great time! We enjoyed our stay! I would definitely recommend this place! Lots of things to do outdoors and indoors including pool table and ping pong. Lake is within walkable distance and with beautiful views. Lots of rooms, good for big groups. Owners were easily reachable for any questions. We spent a great time! Thank you all for staying with us, so glad you enjoyed yourselves. Come back soon. All in all, this was a great vacation. I planned this trip with some family, some came from out of town, most of us were from Denver. We wanted to come out near Durango so we could take the train from Durango to Silverton. Since it’s a 6 Hour drive from Denver I decided to rent a house for everyone to stay in. The price was great for 10 of us to stay here! My GPS freaked out and we went the wrong direction once we got on purgatory drive. Just take a right before you go over the little bridge and it will take you right to it. The house was pretty cool. It’s likely that no matter where I went, my stuck up aunt from California would have found some way to complain about it. I did agree with her on a couple of things. 1. The bathrooms could use a good scrub down and we found trash under the beds. So the cleaning crew did a less than perfect job. 3. Everyone in my family said the beds were uncomfortable. They were. We used the pool table and ping pong table in between fishing and canoeing. We never got bored. The hot tub didn’t work when we got there but they had someone come out within hours and fixed it all up. I’m glad we had them do that because we were in it all the time. The hot tub out on the deck overlooks the lake and you really can’t beat that view. We especially enjoyed the hot tub in a torrential downpour! The hike down to the lake from the house was pretty steep, two of my family members could not make it because of knee issues. My 70-year-old dad made it down but took a tumble by the water. He was fine, but I was wondering what I would have done if he had gotten hurt down there! Yikes! Be careful! My family was raving about the trip the moment we packed up and none of us wanted to leave. I highly recommend staying here. One of the best parts about is the communication with the owner. McGregor is very responsive! If the cleaning crew had done their job right, I probably would have given this cabin five stars. Here you will be glad you did! Weekly Rental Rates Quoted include One Night Free.